The mission of the South Atlantic LCC: Facilitate conservation actions that sustain natural and cultural resources, guided by a shared adaptive blueprint. We work together to design and achieve a blueprint for the future. At the heart of all we do is the South Atlantic Conservation Blueprint—a shared vision for the future of our region. Your cooperative is committed to improving and implementing this comprehensive, interactive plan. As the name implies, the Conservation Blueprint is a living spatial plan for dealing with future changes, from urban growth to climate change. The Blueprint can be used to find places to pool resources, raise new conservation dollars, guide infrastructure development and illustrate how each change affects the bigger picture. The increasing human demand for resources and other forces of change are reshaping the landscape. The Blueprint provides the conservation community with a consistent, cross-boundary, cross-organization plan for how to address that shift. 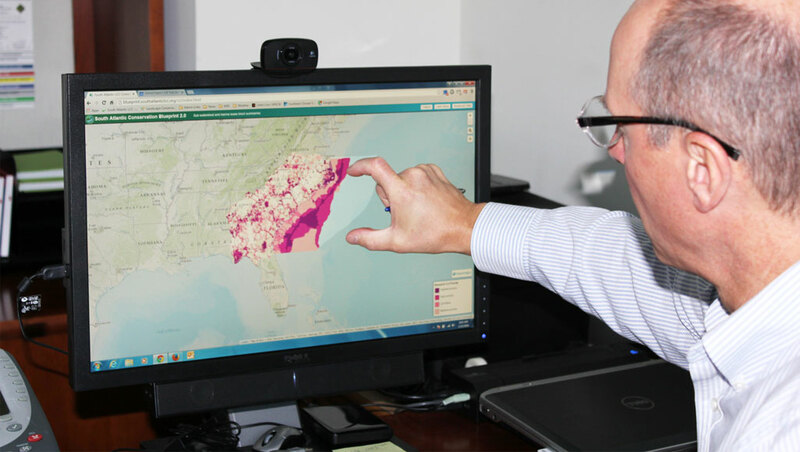 It’s available on the Conservation Planning Atlas (CPA), a sophisticated, science-based mapping platform designed to inform decision-making as well as allow people to participate in its development by adding additional data layers. You can also find the Blueprint on the Simple Viewer, a less complicated interface for exploring the Blueprint and finding your piece of this larger plan. Over 500 people from more than 150 different organizations have actively participated in the Blueprint development process so far by attending workshops, commenting on drafts, reviewing indicators and many other ways. This group represents a wide variety of natural and cultural resource conservation experts from across our region as well as neighboring regions. And, the Blueprint been used in at least 30 different projects, helping members of the cooperative bring national fire resilience funding to the region, compete for coastal wetlands protection and climate-smart wildlife management grants, provide landscape-scale context for public lands planning, prioritize fish passage efforts, and much more. We develop shared indicators of ecosystem health. These indicators represent the health of the South Atlantic’s lands and waters, allowing us to measure the condition of our natural and cultural resources. Teams of experts selected indicators for the freshwater, terrestrial and marine environments according to important ecological and social criteria. Because the ecosystems of the South Atlantic are complex, we can’t measure everything all the time. But, working together, we can measure the success of the South Atlantic Conservation Blueprint by evaluating a suite of carefully chosen indicators. We track progress toward improving the state of the South Atlantic. The State of the South Atlantic is a South Atlantic LCC publication designed to help us all understand our living landscapes—from hardwood forests and aquatic diversity in the Piedmont ecoregion to ships unloading freight near historic lighthouses along the shoreline. In addition to highlighting the area’s conservation successes and challenges, the State of the South Atlantic provides a report card for the current condition of our important resources. You can read about all the South Atlantic ecosystems, learn how they currently score in terms of ecological health and read forecasts for the future. The scores are based on the measurement of key natural and cultural resource indicators, all detailed in the State of the South Atlantic.